The 2010 Winter Olympics officially opened in Vancouver this past Friday, and this marks the first Olympic Games at the height of the Twitter craze. Sure, Twitter was also around during the 2008 Summer Olympics, but the microblogging service wasn’t nearly as popular then as it is now. Other social networking sites have only gotten more popular in the past two years as well. They will give friends, family, fans and, yes, reporters updates on their training and competition, random musings, pictures, links to their Web sites and other peeks behind the Olympic curtain that the public can’t usually see. It will save them time on the phone, help them build their fan base and allow them to get their message out, unfiltered by the so-called traditional media. It might also serve up a bit of instant gratification when the grind of training and waiting takes its toll. Twitter is not specifically mentioned in the IOC Blogging Guidelines issued for the 2008 Beijing games (PDF) or the updated version that has been released for Vancouver (PDF). Condron says that Twitter use is allowed, however, as it is still a blogging site — it’s just limited to 140 characters. Only those persons accredited as media may act as journalists, reporters or in any other media capacity. Under no circumstances, throughout the duration of the Olympic Games, may any athlete, coach, official, press attaché or any other accredited participant act as a journalist or in any other media capacity. The International Olympic Committee (IOC) has its own Twitter account and Facebook page. It is also on Flickr with its own photostream and the Vancouver 2010 Olympic Photo Group that currently has more than 2,200 photos submitted by 241 members. 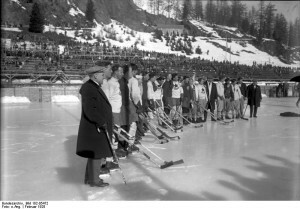 Image from Deutsches Bundesarchiv (German Federal Archive), taken February 1928 at the Winter Olympics in St. Moritz, Switzerland, used under its Creative Commons license.